Tom Norton (centre) celebrates a goal against Swindon with Phantoms' teammates Ales Padelek and James Ferrara. Photo: Tom Scott. 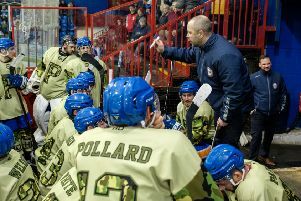 Peterborough Phantoms coach Slava Koulikov wants to finish a tough run of games in the same style they started it. The city side beat fellow NIHL Division One South title challengers Swindon 6-2 at Planet Ice last Saturday (December 23). Phantoms coach Slava Koulikov watches his side's win over Swindon. Photo: Tom Scott. Koulikov’s men now face a series of three more huge clashes in the space of four days starting with a return date at Swindon tonight (December 29). That is quickly followed by back-to-back fixtures against table-toppers Basingstoke, who currently sit one point clear of Phantoms at the head of the standings. Phantoms travel to Hampshire on Saturday (December 30) before welcoming the Bison to Planet Ice for a 5.30pm showdown on New Year’s Day. “The result against Swindon was one of our best of the season - both in terms of scoreline and the way my guys fought to earn it,” said Koulikov. “We competed well for 60 minutes and the performance of every single player made me very proud. “We have many more big games coming up, but it was great to start such an important stretch with two points. We will go into this weekend a very confident side. “It’s a tough spell when you consider we have four games against other top teams all in a row, but it is also an easier schedule compared to what we have been used to in the past in the English Premier League when having six or seven games over the Christmas and New Year spell. “Our aim for this season is to challenge for trophies and we are in a good position to do just that. Phantoms reached Christmas as the leading scorers in the division with 82 in 15 outings, one more than Bracknell aho have also played a game more. The city side also have the second meanest defence having conceded just 31 goals, five more than leaders Basingstoke.